The multi-syllabled pomposity and obscurity of much academic writing, particularly in the social sciences, often attracts derision and damnation. The contempt has generally come from outside the campus. But here’s a surprise: Michael Billig, professor of social sciences at Loughborough University no less, has written an insider’s demolition of his colleagues’ writing. His Learn how to write badly: how to succeed in the social sciences rounds up the usual suspects: jargon, acronyms, passives, and using five pound words when five pence ones would do (but, strangely, neglects the long sentences and page long paragraphs). In particular, he condemns the constant turning of verbs into nouns: ‘beware of long words ending in –ization and –ification’ and ‘write about people not things’ Billig wisely advises. He quotes some of the worst academic writing and, sometimes, names the perpetrators. Billig tears apart the arguments put forward in defence of the ‘academic style’ and exposes the inhumanity and subconscious elitism that often underlies it. Read more: Want to learn to write badly? Then go to university! Plain English Campaign officials are currently reporting on a wave of protests regarding attempts at consultations on local development plans. ‘From Dundee to Derbyshire, we are receiving complaints from people who feel their right to a democratic voice has been taken away’ says campaign founder Chrissie Maher. Graham Stringer, MP for Blackley and Broughton, has rightly savaged NHS Greater Manchester’s hideous and gobbledygook-ridden ‘Healthier Together: Strategic Direction Case’ document. Perhaps this is the case? Mid Devon District Council leaders have been forced to reconsider banning the apostrophe from street signs in the area. Plain English Campaign was swift to praise the council for its ‘brave’ decision to reconsider the issue. Councils who waste taxpayers’ millions on unnecessary translation have been heavily criticised by a senior government minister. Communities and Local Government Secretary Eric Pickles ridiculed the amounts spent on translation services and bemoaned a culture that could spend £600 on translating a glossy magazine into Urdu for a single complainant. We have re-designed our corporate membership logo. If you are a corporate member and would like to receive the updated logo, please let us know at info@plainenglish.co.uk, along with your membership number and we will send you an updated copy. Please note that you are free to continue using the older logo if you wish. Complex medical jargon and unclear diagnoses could put lives at risk, according to new research. A study has found that nearly half of working-age people cannot understand or use everyday health information. Those with poor reading skills and the biggest health problems are thought to be most at risk. It's Plain English Day on Friday, 14 December. Each year, we present awards for the best and worst examples of English. 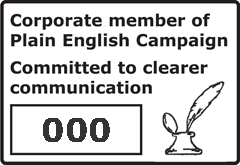 The main awards recognise organisations and individuals who have genuinely made an effort to present themselves using clear and concise English. The infamous 'Golden Bull' and 'Foot in Mouth' awards inject a sense of mischief into the proceedings. All the award winners can expect to receive media coverage.